What is Spiractin (Spironolactone) used for? Spiractin (Spironolactone) is an oral potassium-sparing diuretic prescribed for the treatment of oedema or congestive heart failure. The medication works by reducing sodium absorption in the body to draw away any extra water to be eliminated through urination. This action may relieve symptoms such as swelling or high blood pressure. Your doctor may prescribe this medication to be used along with others or for the treatment of other unlisted conditions, as well. How should I use Spiractin (Spironolactone)? Spiractin (Spironolactone) is normally prescribed to be taken once daily at a dosage of one tablet, but your particular instructions will depend on your age, weight, current health, and the severity of your symptoms. These should be swallowed with a large glass of water and may be taken with or without food, although a meal or snack is suggested before use if you get an upset stomach. Do not chew, split, or crush the tablets before using them as this may destroy or change the effects of their contents. It is also recommended to take the doses early in the day as they may cause increased urination and can cause sleep disturbances if taken just before going to sleep. Increase your fluid intake while using this medicine to prevent dehydration. Ask your pharmacist or physician any questions you have about the medication to ensure the correct usage. What are the side effects of Spiractin (Spironolactone)? Serious side effects that may require immediate medical attention are low sodium levels, high potassium levels, an electrolyte imbalance, or signs of bleeding from the stomach such as discoloured stools or coughing up a substance resembling coffee grounds. Inform your doctor as soon as any unusual symptoms occur to make sure the necessary alterations are made to your dosage or frequency of administration. Spiractin (Spironolactone) should not be used to treat patients who have Addison`s disease, acute renal insufficiency, anuria, hyperkalaemia, or severely reduced kidney function. Also disclose if you have porphyrias, reduced kidney function, or reduced liver function. These conditions may lead to unexpected health problems requiring special alterations to your treatment. 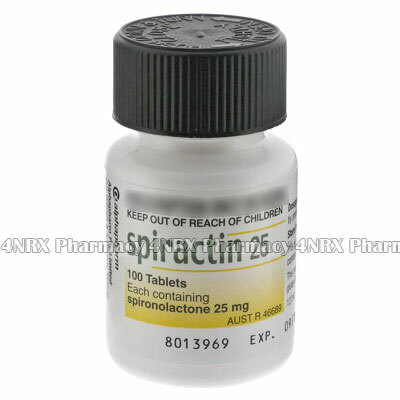 Strictly use Spiractin (Spironolactone) as prescribed and follow all instructions provided by your doctor. Safe, suitable, and optimum dosage can vary and is dependent on the patient`s health and medical history, as well as the condition you are treating. Spiractin (Spironolactone) may not be safe or suitable for all patients. Always ensure your doctor is informed if you are pregnant or breastfeeding, using any other type of medication (including non-prescription medicine, vitamins, and supplements), as well as if you have any allergies, other illnesses, or pre-existing medication conditions.